Dim the lights, strike up the orquesta típica as dancers take the stage for a presentation about how to optimise the relationships between marketers and their advertising agencies. Under the title; It Takes Two To Tango (& Deliver +37% Better Creativity), Aprais founder and chairman Kim Walker, will speak at 11:00 on September 27th, 2018 at the Suntec Convention Centre in Singapore. His speech comes as the agency business is under attack from all sides, subjecting the client-agency relationship to more strain than ever before. 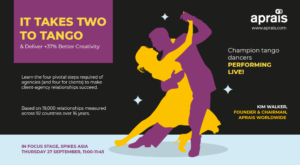 Assisted by Asia’s No.1 tango dancing couple, Kim will explain four pivotal steps that agencies and their clients need to take to make the client-agency entanglement succeed and to show that it really does “Take Two To Tango”. Using analysis from the Aprais database of 19,000+ client-agency relationships, Kim will prove that better relationships deliver better work than those performing badly. Tango partners don’t need to be in love to succeed, but regardless of how good they may be individually they will either improve together or fail together. Sound familiar? If you are attending Spikes 2018, please drop by and say hello to Kim. Are Agency Relationships Really Better in the Americas?